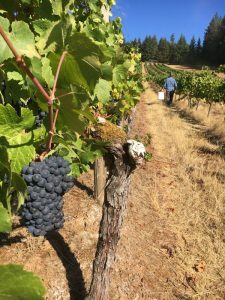 Woodhall III Vineyards (WHV) was begun in 1976 by Eugene, Oregon residents Dr. Frank Baynes and his wife, Betty. Frank was a physician at University of Oregon Student Health and also practiced sports medicine for the U of O football team. He was a colleague of Dr. Dan Jepsen, owner of Alpine Vineyards, a 30-acre commercial vineyard and winery neighboring WHV on the east side. WHV is a 26-acre property located on Greenpeak Road, two miles west of Alpine, Oregon in Benton County, approximately 25 miles south of the OSU campus. The name comes from two Baynes’ family estates, one in England (Woodhall I) and another in New York state (Woodhall II). The property is primarily a south-facing slope, 450 to 700 feet in elevation, with approximately 15 acres suitable for wine grape production. Approximately 9 of these 15 acres could be considered adequate to ideal for research vineyards. The site is fairly warm and typically produces relatively early maturing, high quality, wine grapes. It is generally regarded by wine industry professionals as an excellent vineyard site. Properties to the north, west, and south are primarily commercial timber lands with a few residential sites. The original concept developed by the Baynes’ was to provide high quality wine grapes to amateur winemakers. (They eventually had over 100 customers for the fruit they produced.) Vines were first planted in 1977, and Frank continued planting until the late 1980s. He ended up with about 13.5 acres planted to 22 different varieties: Pinot Noir, Chardonnay, Pinot Gris, Müeller Thurgau, Pinot Blanc, Cabernet Sauvignon, Cabernet Franc, Merlot, White Riesling, Sauvignon Blanc, Pinot Meunier, Gewürztraminer, Gamay Noir, Chenin Blanc, Grignolino, Chasseles, Flora, Petite Syrah, Zinfandel, Pinot St. George, Grand Noir, and Napa Gamay. The vine spacing was 9′ x 6′ and vines were cane pruned and grown in a modified vertical upright canopy. The trellis was constructed of treated 4-5′ posts, 100′ apart with additional small wood posts at each vine. Seven wires were run: one fruit wire at 30″ height to tie fruiting canes, and 3 pairs at 12″, 24″ and 36″ respectively, above the fruiting wire for tucking in canes as they grew. Trellis end assemblies, materials, and construction techniques were mediocre at best, which resulted in continuous trellis failure. In 1985 Betty Baynes was diagnosed with a terminal illness, and she passed away in 1986. Before her death, Frank and Betty approached the OSU Foundation and OSU Horticulture Department regarding donation of the property (and eventually other assets) for use as a research vineyard. This included a deeded portion of the property designated as a cemetery with six plots. OSU accepted the donation and the ownership was transferred to the OSU Foundation in undivided interests over a 10-year period, from 1986 to 1995. The details of this donation can be found at the OSU Foundation. Two endowment funds were set up by Frank, “Woodhall Capital Improvement” and “Woodhall Maintenance”. The initial capital was obtained from the donation and sale of Frank’s residence in Eugene, OR upon his death in August, 1999. The Woodhall Maintenance fund is dedicated to maintaining the cemetery indefinitely under OSU Foundation ownership. Since the OSU Horticulture Department currently maintains the cemetery as part of managing the vineyard, it receives the proceeds from the Maintenance fund. 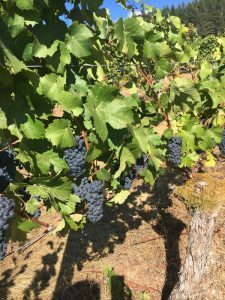 The proceeds from both endowments are available to the OSU Horticulture Department only so long as the WHV property is being used and managed as a research vineyard. If the vineyard property is sold, a portion of the proceeds will go to the University of Oregon. Responsibilities for site management and farming activities at WHV were assigned to the Horticulture Department Research Farms Manager, in addition to Lewis Brown Farm (LBF) and the Vegetable Crops Farm (VCF). OSU Horticulture began farming at WHV in crop year 1987. Frank turned over 12 rows of Chardonnay in B block, and 12 rows of Pinot Noir in blocks C, D, and E (~ 3.2 acres). The remainder of the vineyard was managed and worked by Frank. During the first two years for OSU at WHV, 1.04 acres of existing vineyard were used for research. In 1989 and 1990, new research plantings were added. It was Frank’s wish that OSU continue to provide grapes to amateur winemakers whenever possible. It became quite apparent that maintaining all the existing vineyard plantings was conflicting with research needs. New plots planted in 1997 combined with vine removal which continued through 2002, have resulted in the current vineyard size of 5 acres. The size of the research plots peaked in 1997 at 5.29 acres and is currently 2.17 acres. 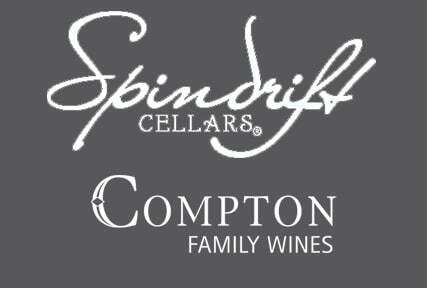 Spindrift Vineyard Manager, Winemaker and Owner, Matt Compton started his wine journey at Woodhall Vineyard in 1994 as a student and later assistant vineyard manager of the property. 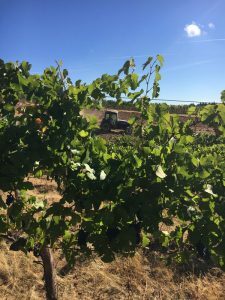 Matt learned vineyard management and winemaking from Scott Robins and through his coursework at Oregon State. Today, Spindrift is the only commercial winery utilizing Woodhall fruit and proudly releases amazing examples of Chardonnay and Pinot Noir from the vineyard each year labeled as “OSU Woodhall”.